Black Friday is about a month away but the deals an promotions have already started, eBay is hosting a 10% off promotion right now that will let you save 10% on a bunch of items, including popular electronics that might not be discounted on Black Friday. On their homepage, eBay reveals that all you have to do to get the discount is to apply the code “PICKUPTEN” at checkout before 8:00 AM EST Friday. There’s no minimum for the order, and you can pile up a bunch of products to shave 10% off them all. There is one caveat: the discount is capped at $100. The discount also only applies to the purchase price and excludes shipping, handling, and taxes, as expected. Only eBay users registered on eBay. com, eBay. ca and cafr.ebay. ca, with an address located in the United States, Canada, Latin America or the Caribbean are eligible for the Coupon. 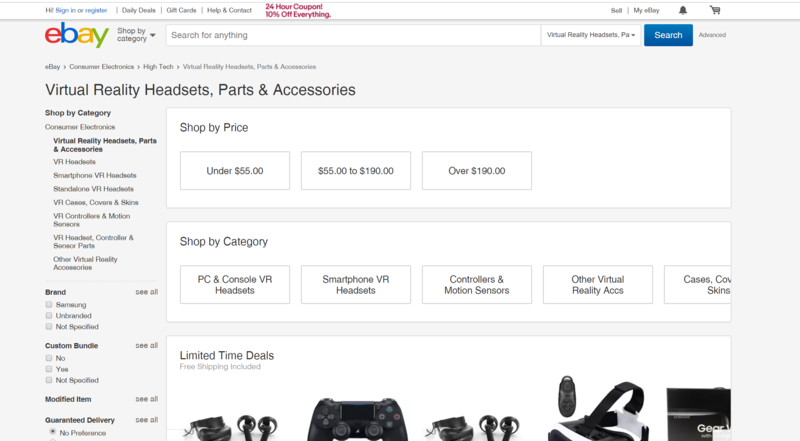 This might be a good opportunity to save some money and get some VR accessories, you can click here to check out what they have. You can also see some of the items we have listed in our shop.